Monday’s storm center is long gone, but it was expanding and getting stronger as it departed. The combination of that existing storm and incoming high-pressure from Canada is generating wind gusting from the northwest past 30 mph this morning. At the same time, many locations cooled to 10 to 15 degrees, in some cases subzero in northern New England. This means the wind chill factor for many of us is sub-zero early Tuesday morning. But we have plenty of sunshine Tuesday, with a high temperature in the teens north and 20s south. Wind will let up later in the day but prepare for midwinter for going up a ski lift, toe warmers and hand warmers Tuesday. High pressure comes right over Tuesday night, that means the wind will go slack, with very dry air in a clear beautiful full moon. We will have radiational cooling and temperatures may actually be lower than Tuesday morning but without the wind chill. 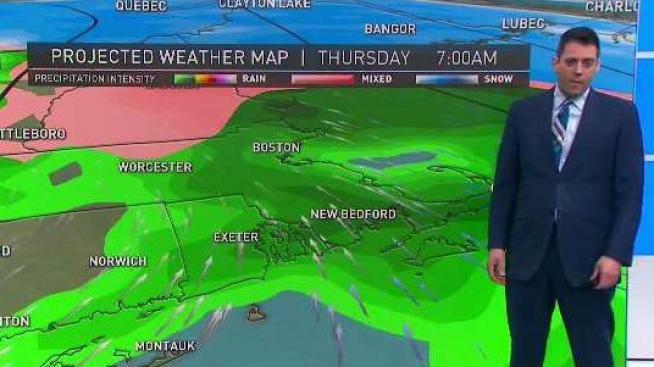 A storm system bringing snow to the Midwest and flooding rain to the southeast is aimed at New England Wednesday night. We will have sunshine Wednesday morning with increasing clouds in the afternoon, High temperature close to freezing. Snow will arrive in western and southern New England after sunset. After a brief burst of snow, precipitation will change to sleet and freezing rain and rain and southern New England late at night. For central and northern New England, the wintry mix lasts through Thursday morning. We may have some delays or cancellations Thursday because of slick conditions. Our First Alert Weather Team has declared a First Alert for Wednesday night into Thursday morning for a burst of snow and wintry mix that will likely leave lingering impacts for the morning commute Thursday. Although only one or two inches of snow are expected for most of the Boston area, with two or three inches in southern New Hampshire and more in Northern New England, the burst of Wednesday night snow from around 9 p.m. to the predawn hours Thursday will be followed by a brief period of sleet and freezing rain. This will be before changing to plain rain showers Thursday morning. This combination should make for slick travel overnight Wednesday night and for the Thursday morning commute. Low pressure ultimately tracks to our north on Thursday, with a warmer wind from the southwest and some sunny breaks. Parts of southern New England may warm to 50 degrees. It’ll stay in the 30s and 40s north. Ski areas likely get 5 to 10 inches of snow. It looks quiet for Friday and Saturday with temperatures in the 30s and lower 40s. Sunday features another wintry mix, likely changing to rain in southern New England. Next week looks active too, stay informed with our First Alert 10 day forecast.